Self taught artist Paul Kidby was born in West London in 1964. He left school at 17 and worked as a commercial artist before becoming a freelance illustrator in 1986. He is best known for being the ‘artist of choice’ for the award winning writer Sir Terry Pratchett, and has designed the ‘Discworld’ book jackets since 2002 and has illustrated many ‘Discworld’ publications including ‘The Art of Discworld’ and best-selling ‘The Last Hero’. Paul has also increasingly built himself a reputation as a sculptor and his limited edition bronzes are collected worldwide. Kidby original artwork and bronzes have been exhibited in London, Paris and widely around the U.K. Today Paul balances his output between Pratchett and his own projects and lives and works in the New Forest with his wife Vanessa. I became an illustrator of books by working at various jobs in the commercial creative industry that gradually edged me another step on the ladder closer to my goal. My journey began at the age of 17 and included making false teeth, painting roller blinds, designing rice pudding and lightbulb packaging, creating greetings card designs and finally over 200 magazine covers – which paid the bills but was not exactly creatively satisfying. My life changed in 1994 when author Terry Pratchett was doing a book signing in the city of Bath, I queued for a few hours to meet him and handed him an envelope of my Discworld character designs. Terry phoned me when he had completed his signing tour to say he liked my drawings and that we might work together. My style is traditional. I use old techniques and processes and don’t create my work digitally. I use hard leaded pencils on smooth white paper or board and for colour I work in oils or acrylics, which I build up in thin layers. I enjoy working tonally and my style is rather meticulous and detailed. I am inspired by The Golden Age of illustration when beautiful books were adorned by the works of Arthur Rackham, Edmund Dulac and their skilled contemporaries. It has not changed the way I create my work but I scan my work and send digital files these days rather than sending the original artwork to the publishers. Social networking has also changed my working habits, I now feel part of an online community rather than an isolated artist! 4) As a self-taught artist, when did you realise you could make a living from your talent? I have always made a living from my talent since the age of 17, through hard work, determination and my choice to initially settle for lower paid creative work rather than higher paid uncreative work. I was, and still am, lucky to have a supportive family. 5) When collaborating with an author or a client, how do you ensure you are able to translate their words into art and convey the message they are trying to portray? One of the best parts of illustration is the design process where the text is interpreted into line; I find this the most fun and also the most challenging aspect of the work. I read the text carefully, make notes and, as a starting point, I often think of an actor who might play the character. Good communication with the client is important at this stage too, for example I originally drew the Discworld character Ponder Stibbons to look like John Lennon but when Terry saw my sketch he told me he imagined him to look more like Bill Gates, so I redesigned him accordingly! 6) Tell us about your collaboration with the late Terry Pratchett and what opportunities did you gain from such a partnership? 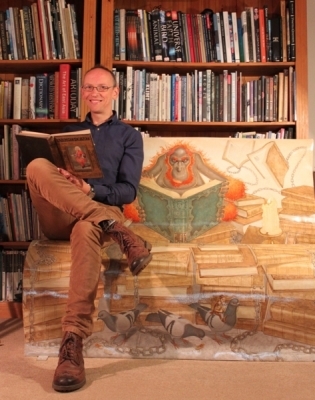 The chance to visualise the Discworld was a life changing opportunity for me. In the early years I would meet Terry often to discuss ideas and show him my sketches. We shared a fascination for history, folklore and a slightly off the wall sense of humour which enabled us to connect our mediums in a happy union. The chance to illustrate the book jackets and internals for so many of his books was an amazing privilege for me and I will always be grateful to him for allowing me to wander his world with my sketchbook. 7) Who or what continues to inspire your work from painting to sculpturing? I am inspired by the natural world: the flora and fauna of the landscape around me and the folklore of The British Isles. I enjoy and take inspiration from attending galleries and exhibitions of all sorts of art. I have a large collection of art and reference books and I enjoy watching films to see how others have created characters, costumes and environments for the big screen. My advice is to maintain good polite communication and be punctual with schedules and deadlines. It’s also important to remember you are working as part of a team, therefore you must expect your work to be critiqued, changes requested and digital alterations with colour tones etc made by the design team, it’s part of the process and not a reason to take umbrage! 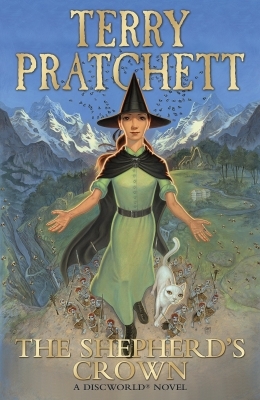 Colour artwork for the book jacket of The Shepherd’s Crown by Terry Pratchett. 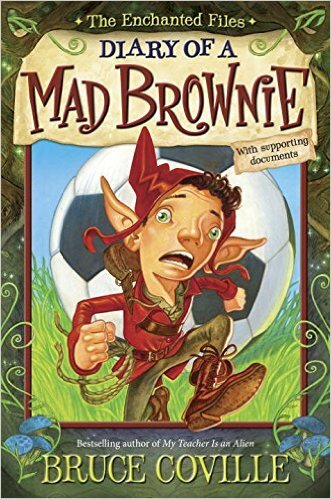 Colour artwork for the book jacket of Diary of a Mad Brownie by Bruce Coville. 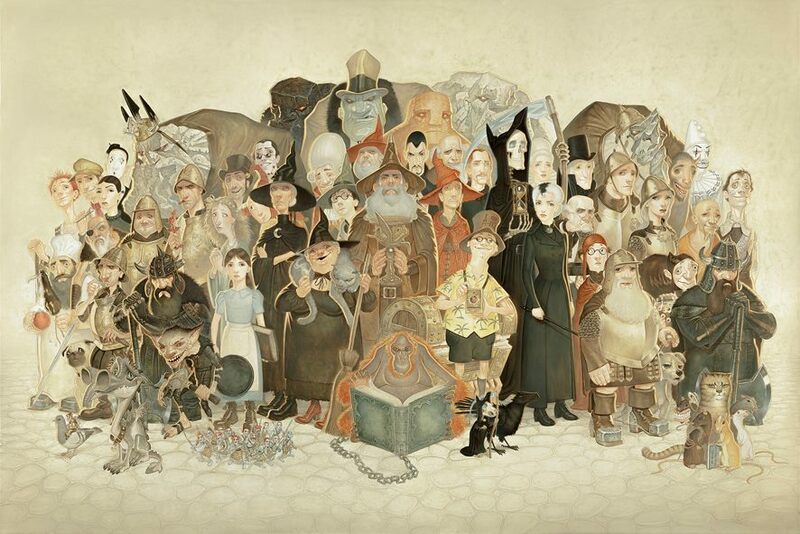 Discworld Massif, a large scale painting featuring over 70 favourite characters from Terry Pratchett’s Discworld. 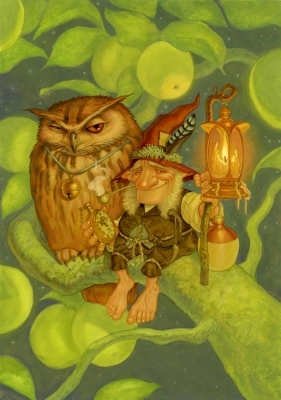 Auld Goggie, a character from The Charmed Realm book by Paul & Vanessa Kidby. Should you wish to know more about Paul, here are his pertinent details. I’m an Australian family man. I have a charming mid-twentieth century single car garage converted into a studio where I used to illustrate, stare blankly out of the window from my swivel chair and stroke my chin. 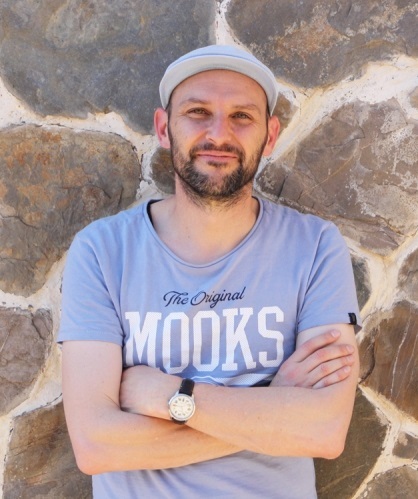 But now I have a new studio in Bolivia, South America in the Spanish colonial city of Sucre, where I volunteer part-time while continue to illustrate for clients in Australia, USA and the UK. I’ve been an illustrator since 1987 but in that time I’ve completed secondary school, university and defected to the design and advertising industries from time to time. 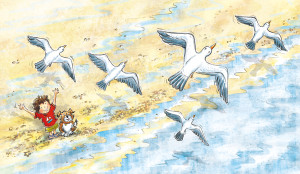 1) How did you become an illustrator of children’s books or similar works? Did being in the advertising industry equip you to make this transition? 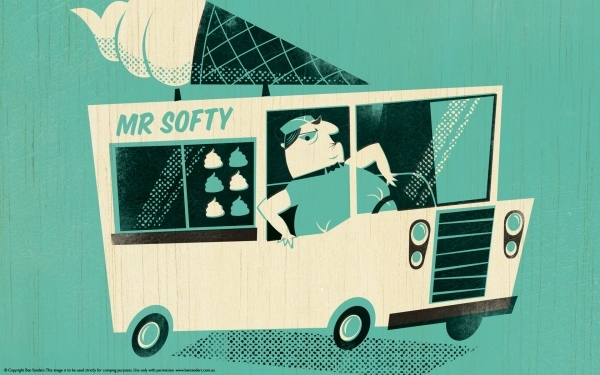 Yes my background in advertising and design was a big influence my return to illustration. I really enjoyed my time as an Art Director and Designer, and during that time I incorporated illustration into as many projects as I could. So it was inevitable that I would find a way back to full-time drawing. Having been on the ‘other side of the fence’, I knew what I needed to do to give freelance a good crack. I found out where to be found, and how to promote myself well enough to gain the work I wanted to do. I’m thankful that it worked out. After establishing myself commercially, I had time to write children’s books and was fortunate enough to have a great agent who was able to connect me to publishers. The creative process for me is actually quite simple. If an idea enters the brain an attempt should always be made to scribble it down, no matter how bad I think the idea may be. After a while there should be quite a few badly drawn but reasonably good ideas on the page. I then need to recognise which idea will work best on the page, as well as deliver the story in the right ‘tone of voice’. I then work up a pencil sketches that will provide enough but not too much detail. Once the sketches have been given the thumbs up it’s time to apply colour. I recreate the drawing on my Mac in a vector format, and devise a simple, muted scheme. I then create a new file for each colour the same way a screen printer would build a new silkscreen for each ink. The separate colours are imported into Photoshop in individual layers and multiplied on top of each other. Often the intersecting of these layers will create new colours similar to letterpress. I then mess up the crispness of the vector shapes by erasing details and applying texture. If I’ve done a good job, we’re all satisfied. We exchange heart-warming emails about how we both enjoyed working with each other and vow to do it all again sometime soon. Well, my dad was in the printing trade (and an excellent artist in his own right). One of his regular clients was a small local publishing outfit who needed a bunch of illustrations for a sheet of kids’ stickers. I was twelve years old, and in the late 1980’s child labour laws were easier to ignore than they are these days, so my dad encouraged me to submit a few drawings for consideration. 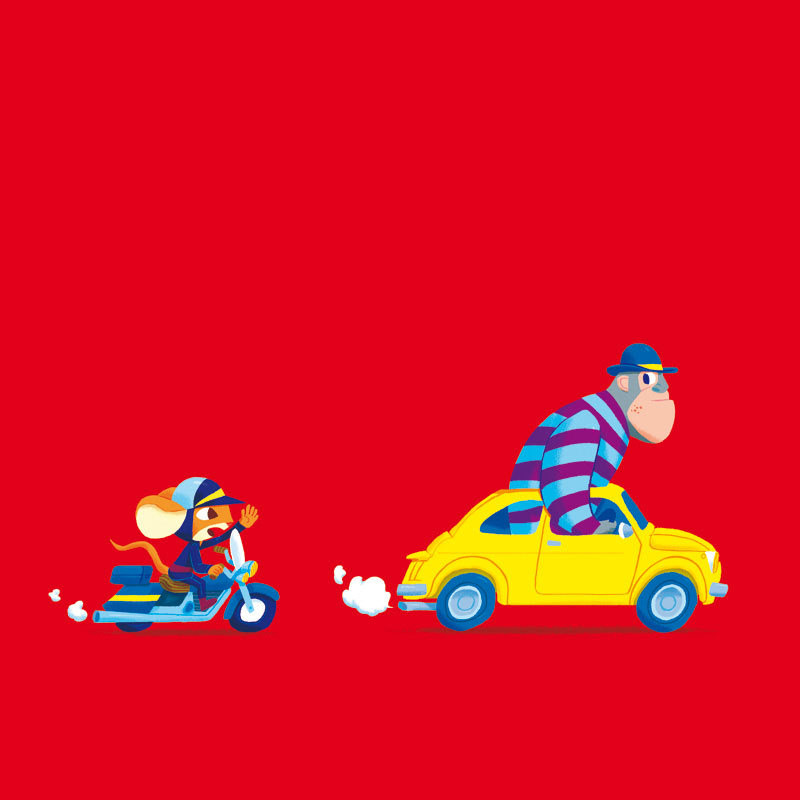 During that summer I illustrated 32 stickers – things like elephants riding bicycles, walruses smoking pipes, apples with bites out of their bottoms – the usual stuff. Each summer holidays throughout secondary school I illustrated a new set of stickers. They were quite popular and the publisher found overseas markets for them, so it was nice to know my work was getting out there. It also meant that I didn’t need to get one of those summer jobs as a spotty-faced supermarket trolley-boy. So it was pretty early on that I got a taste of working as a professional illustrator. It wasn’t until 2004, while working as an Art Director at an advertising agency that I made the decision to become a full-time illustrator. I was hiring illustrators for ad jobs and became a little jealous of their freelance-iness. I quit and started promoting myself as an illustrator. Oh yes, technology has changed EVERYTHING. I couldn’t have imagined as a twelve year old watercolourist that I would be relying so heavily on technology for both communicating with clients as well as the execution of the illustrations themselves. These influences are obvious, but there is an even greater affect. Location. I live in Bolivia, South America now, volunteering, creating books, and illustrating for my commercial clients in Australia, the UK and the USA. None of these things would be possible for me without my computer, its applications and the reach of the internet all the way up the Andes Mountains. Ahhh … technology! My dad is the greatest influence. Our styles are completely different but nobody has influenced me more in this department. He was the one who got me my first freelance gig while I was still pre-teen. My first full time job was at a place called Paul’s Signs. The owner Paul van Gaans is one of the most creative people I know. While we worked on signs in the mid-1990s we spurring each other on creatively. Paul taught me not to settle for less – to keep striving. That’s why we no longer make signs. 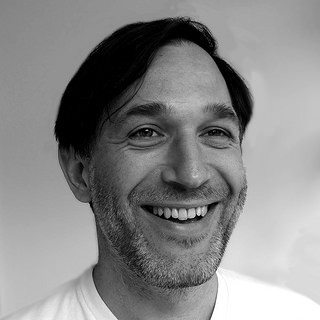 Paul is now a hugely successful 3D Animator with a brilliant body of work. In the recent past I worked collaboratively with a couple of other illustrators and friends in Ballarat. Both Travis Price and Sam Harmer have been influential in bringing me out of my creative shell. On a weekly basis I’m reading stories and attempting to pick up on the right tone. That’s something that I’m used to now after illustrating for hundreds of magazine articles. For me it’s not so much interpreting the words or message, it’s more about what else I can contribute to the story. What can I add to the piece? Can I approach the subject in a different and complimentary way? With picture storybooks, so far in my career I have only illustrated the books I have authored, so it’s a far easier process to understand where the writer is coming from. As I’m writing the books I’m often imagining the pages completely illustrated. 7) Tell us how you came about creating the Ben Sanders gift store and the products that you sell. The Ben Sanders Shop on RedBubble is a fun side-project that has exceeded my expectations. I decided to utilise a bunch of out-of-use illustrations that I felt would work well as household and stationery items like cushions, journals, phone covers and even bed spreads. 8) What advice do you have for aspiring illustrators about being true to themselves and how to navigate the big bad world of publishing? Well, the publishing world can seem big and bad at times, but I think that’s only a perception. There’s so much competition that you really need to have a unique voice in order to be heard, that’s the tough part. When you have the opportunity to publish your work take as much advice as you are given by wiser and more experienced people in the industry. My books improved greatly during the development process, due to listening intently to editors and publishers. At the same time don’t be afraid to have your input and express your vision for the project. A good publisher will appreciate your enthusiasm, and take into consideration your ideas. 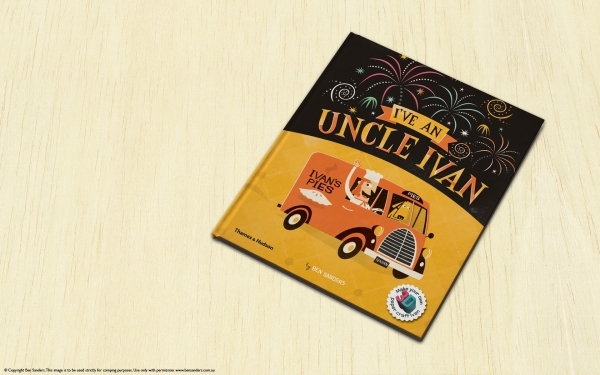 Cover of I’ve an Uncle Ivan children’s picture book. 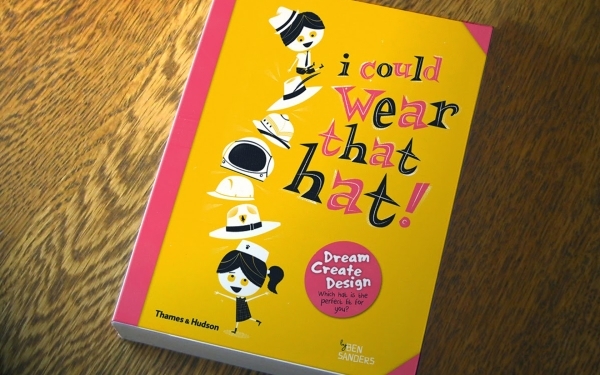 Cover of I Could Wear That Hat! children’s activity book. Buck gets his gut stuck in his truck, limited edition print of a character from I’ve an Uncle Ivan. Should you wish to know more about Ben, here are his pertinent details. 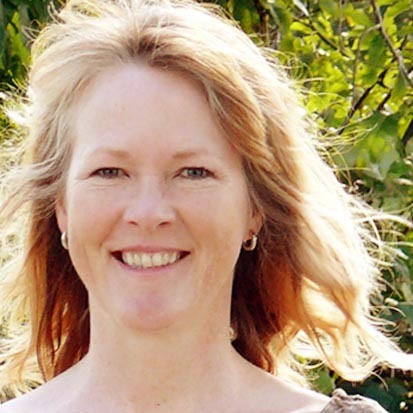 Children’s author and illustrator, Hazel Mitchell is originally from England and now lives and works in Maine. Her childhood was spent in a seaside town in Yorkshire. She can’t remember a time when she wasn’t drawing, and still can’t be left reliably alone with a pencil. When she wasn’t creating art, she was riding horses or rambling along the beautiful Yorkshire coast. She attended art college in the UK and then spent several years in the Royal Navy. She worked as a graphic designer for many years. Now she’s doing what she always dreamed of – creating books for children. Her first trade book was published in 2011 and latest books include Imani’s Moon, One Word Pearl and 1,2,3 by the Sea. 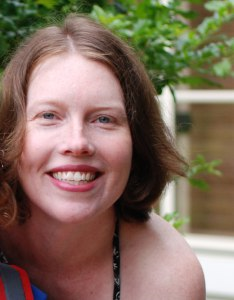 Her first book as author and illustrator, Toby, will be published in 2016 by Candlewick Press. Her work has been recognized by Bank Street’s Best of Children’s Books, Society of Illustrator’s of Los Angeles, Foreword Reviews, Reading is Fundamental, Learning Magazine and Maine Libraries ‘Cream of the Crop’ 2015. She is represented by Ginger Knowlton, Curtis Brown, NYC. See more of her work at http://www.hazelmitchell.com or online in all the usual places. My route to children’s illustration was winding. I was always interested in illustration, and writing, from an early age. Unfortunately, back in the 1980’s when I attended art college, courses in children’s illustration were thin on the ground or, rather, non-existent. It seemed to be a career you just ‘fell in to’. So I studied fine art and then had a long career in graphic design until I moved to the USA. 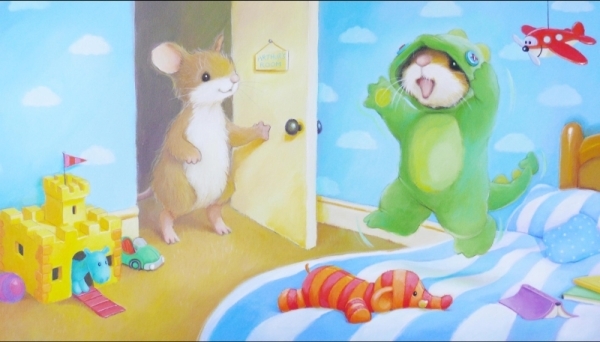 I was working in commercial illustration at that time, as well as painting fine art pieces, and wondering how I could enter the field of children’s illustration. 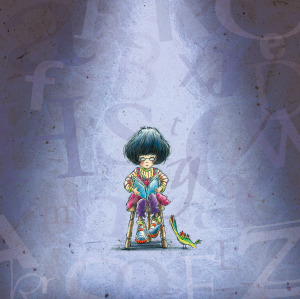 In 2009 I attended my first SCBWI (Society of Children’s Book Writers and illustrators) conference and began to put together a portfolio specifically directed towards children’s illustration. I began to mail postcards to editors and art directors in publishing. In 2010 I was offered my first book contract, which was for a non-fiction book about autism, and I’ve been illustrating for children ever since. 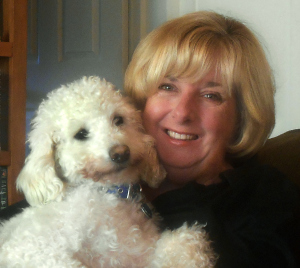 I’ve just written my first book for children about a poodle, ‘Toby’, to be published by Candlewick in Fall 2016. The first thing that people say about my style is that it’s ‘very English’! I guess there’s no denying my roots. M style is quite traditional. I think my line work is the most recognisable. It’s like my handwriting. It took me a while to realize that my line work identified me, now I’m developing that and becoming looser and freer. I think my drawings are a little ‘quirky’. When you begin to illustrate I think you try to cover up your ‘quirks’ but really, those oddities are the things that make your work individual. So now I embrace them! I’m quite disciplined in my creative process, I think that comes from years working to deadlines as a graphic designer and from being in the military. I usually begin by writing some written notes about an illustration project. What it embraces, what springs to mind, connections … all kinds of things. I write in a sketch pad. Alongside, I’ll start to noodle around with sketches, characters. I think about the setting. The age of the reader. The characters. Is it black and white or colour? What’s the mood of the book? It’s a synthesis that starts to come together. I may start by researching place, people, animals – depending on the story. Maybe I’ll take some time to look at other books along the same lines. After I’ve sketched for a while I’ll dive straight into thumbnail layouts of the book, see how the words and pictures might work together. What the arc of the story is and the climax points. Sometimes I’ll make a grid of this, with the pages, emotions, situations and feelings listed. This is the exciting part. Anything can happen and most things are possible! I think I enjoy this stage the best. Then I’ll get into larger page layouts, working out composition of the pages and where the ‘page turns’ will happen. All this is building towards that final page which will tie the story together. I often work in different styles and mediums depending on the content of the story. I love to draw in graphite, add water colour washes and colour on the computer (photoshop, usually). I also like mixed media and pen and ink. I’d love to do some work in oils, but haven’t as yet! It makes it fun and interesting. I don’t think I’ll ever be the kind of illustrator who only works in one style – discovery makes the work fun! The longest part of the process for me is the drawing stage. Getting everything right before moving on to the final images. And the hardest part is keeping the vision you had in mind at the beginning of the project fresh in the final art. Hmmm. I don’t think there was ever a choice for me. It’s all I was good at! So as soon as I left college I earned my living from art somehow, although not always in the field I wished for. I wish that there had been more choices when I left art-college, but the path I followed led me to where I longed to be in the end. I am lucky to make a living from doing what I enjoy … mostly I have always worked as a freelancer. It’s not an easy life. But I wouldn’t change it! Yes, like most of my generation I started out doing a lot of mechanical art, especially in graphic design. Cut and paste etc. I was lucky to be able learn how to use computers back in the late 1980’s. I have always used computers throughout my career. In my illustration work, though, there has always been a hand drawn element and I think that gives it my ‘style’. I love to incorporate the use of computers in my work. I don’t think I can work without them now! From the ease of changing compositions in the beginning of a work, to adjusting the final images they are so useful. And I use digital colour a lot. Of course, the ease of creating full colour images is huge in all visual industries these days. Plus the ease of proofing and submitting finished work makes life easier for all. But maybe one day I will just send my publisher a big crate of canvases to scan! I am still very much influenced by the illustrations I loved as a young person created by artists such as E.H. Shepherd, Pauline Baynes, Edward Ardizzone, Arthur Rackham, Raymond Briggs, Ralph Steadman, Quentin Blake, Beatrix Potter, Kate Greenaway, and so many Victorian and Edwardian illustrations that I used to pour over. In fine art I was a sucker for pre-raphaelites, the art and crafts movement, impressionism, fauvism. I loved detail and richness. I was also hugely influenced by children’s cartoons on the BBC. So much good work! I still love to watch them. Very different from American tv … but I did love Disney and Tom and Jerry, too! However, I now probably know more about the USA children’s illustration field, because I’ve had a crash course since moving here. My modern favorites include David Small, Garth Williams, Emily Gravett, Helen Oxenbury, Loren Long, Maurice Sendak, Marla Frazee, Ashley Bryan, David Weisner, Tony Diterlizzi to name a few. I think that’s a kind of alchemy. Luckily I seem to have been creating something that fits the bill so far. I do feel quite responsible when I receive a manuscript and you know that that author has their own vision. But the publisher is hiring you to do a particular job as the illustrator and you bring your own vision and ideas to the table. The art director is the person one relies upon to make sure the book is satisfying the translation of the text. I like the team work that comes with working on the making of a book. Sometimes you’ll receive a brief from the publisher, or guidelines, sometimes the artwork is totally up to you. A book is a sum of many parts – the vision of the author and the vision of the illustrator, brought together by the publisher. 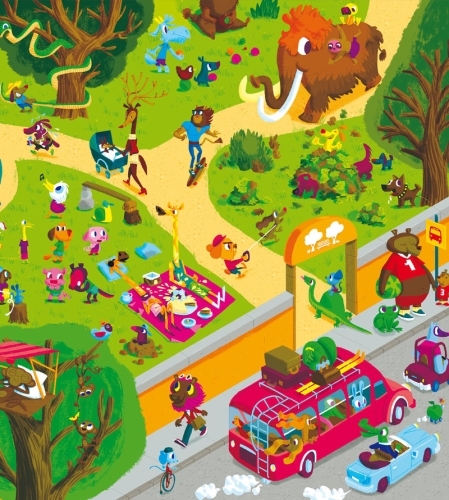 If there are too many constraints placed upon the illustrator, then it’s likely that the end result will not contain that ‘spark’. There has to be freedom to develop an idea and add that ‘something extra’ to the words. The author has done their job in creating their story and the illustrator must bring it life with the space that the author has left them. A good collaboration between words and pictures is where the magic happens for the reader – who of course brings their own creativity to the story by way of their imagination! That’s a hard question! Often the work I am proudest of is the last project I worked on! ‘I did it!’ Sometimes, when faced with a new book or idea, starting it can be the hardest thing. (Can I do this again? Will it be any good? So much fear, in the beginning!). 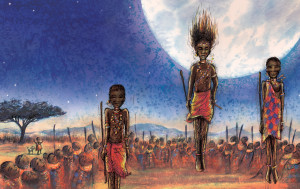 So, I guess I’ll say I’m very proud of ‘Imani’s Moon’ by JaNay Brown-Wood from Cahrlesbridge Publishing, (my lastest book) which is about the aspirations of a small Masaai child who wants to touch the moon. It’s my first book with a child of colour as the main character and I got to use a lot more hand-done techniques in it. Know this is a journey. Enjoy it. Don’t be in too much of a hurry. Practice your craft and be open to learning at all stages of your career. Read and feed your soul! One Word Pearl – Mixed media, created with layers of collaged paper scanned and type added, graphite line work and coloured digitally in Photoshop. Imani’s Moon – Created using graphite and watercolour underpainting, coloured digitally in Photoshop. Seagulls – Graphite line art, digitally coloured in Photoshop. 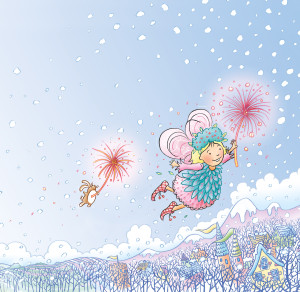 Where Do Fairies Go In the Snow? – Hand drawn line work coloured digitally in photoshop. Should you wish to know more about Hazel Mitchell, here are her pertinent details. 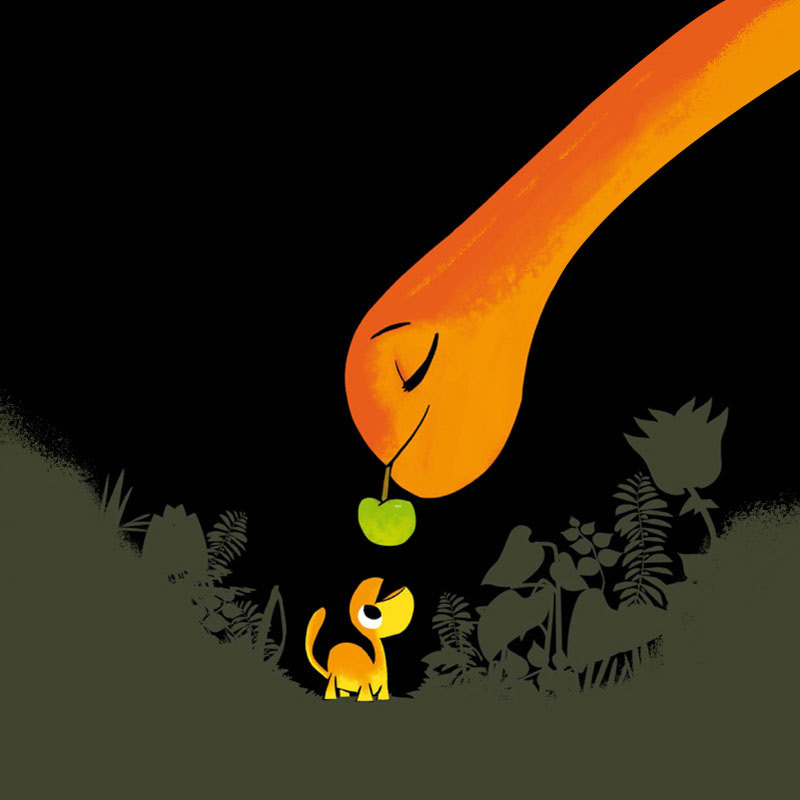 A prehistoric tadpole grows up in the footprint of a dinosaur, where he gets in touch with his inner tyrannosaur. My wife and I found frog eggs in our little backyard pond. I rescued them from the goldfish and raised the tadpoles in an aquarium. At a certain stage of their development, when their hind limbs and tails were large but their forelimbs were tiny, I noticed a resemblance to T. Rex. 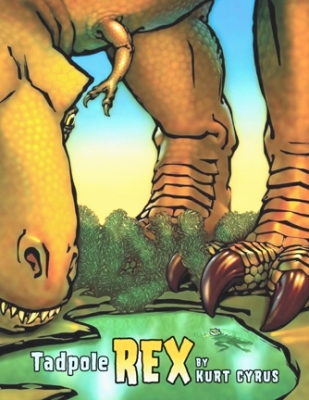 A little research confirmed that frogs did coexist with the dinosaurs, and this gave me the idea to write and illustrate Tadpole Rex. I hope their love of reading is somehow enhanced, or at least not diminished! And especially I hope that their curiosity about the natural world around them is piqued. I don’t really write lessons or morals into my books. 4) After bouncing from job to job, how did you come to write and illustrate and why did you pick this genre? All that job-bouncing was getting really old. I had been drawing as a hobby for my entire life, and felt that it was the one thing I could do better than the average person. The writing aspect was something I developed just so that I’d have stuff to illustrate. Children’s books are a good fit for me because of the storytelling, both verbal and visual. My drawing has always leaned toward storytelling. Often it begins with a visual concept, but the writing must come first. Toward the end of a project I’ll often tweak both the words and the pictures to get as perfect a flow as possible. There’s no escaping the influence of Dr. Suess. McElligot’s Pool was the big one for me. But I think a guy named Carl Barks had a bigger impact on my style of storytelling. He wrote and illustrated the Disney duck comics for several decades, and spun some great yarns. The joy of feeling something finally click into place after having struggled with it. My drawing skiils exceed my painting skills, so my illustrations are basically colored drawings. The first few books were illustrated in watercolor, oils, or scratchboard. Now I draw digitally. Earning a living from it began to happen after five or six books. I’m finishing up a picture book titled Billions of Bricks, to be published next year, and starting illustrations for a picture book titled Shake a Leg, Egg! I’m also revising a middle grade novel. Variety is the spice of life! 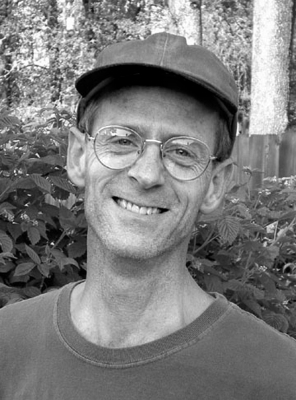 Should you wish to know more about Kurt Cyrus and would like to purchase his book, here are all his pertinent details. 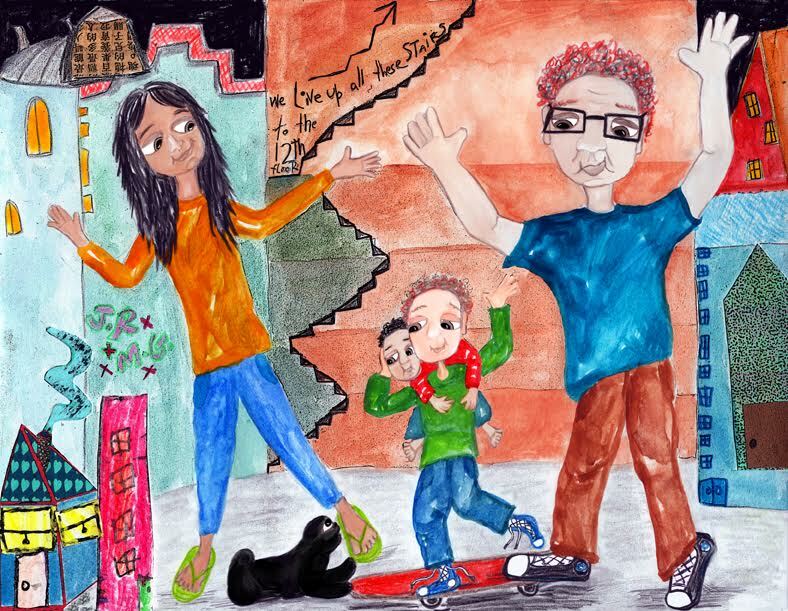 Painter of many years, now also writing and illustrating children’s books, with two bilingual picture books recently published by Zebra Ginkgo Group. I am a painter of 35 yrs., ten yrs. ago I began illustrating watercolor illustrations for authors and several publishers. Three years ago I began writing and illustrating my own stories. I’ve written and illustrated eight books, two are published thus far, listed above. I hand render in mixed media, still primarily watercolor and digitally edit my illustrations and book covers. 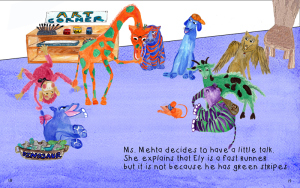 My characters are described as animated and full of whimsy and emotion. I am very involved with rich color, but with an earthy feel, as in my paintings. When I began illustrating children’s books I and promoted my work via SCBWI and online, I found my portfolios attracted queries from authors and several publishers. Though sporatic, the freedom to negotiate timelines gives me time needed to also work on my own painting and children’s books. 4) Who are your biggest influences in your artistic career? Chagall, Klee, Miro, Van Gogh, Monet, Bonnard- in the children’s book arena Sendak is my favorite along with Shel Silverstein. I work closely with the author to understand the ‘look’ and specifics they are hoping for and do my best to meet their expectations. I always offer my own ideas for the illustration if they are not clear what they want, and I send pencil proofs with a willingness to edit at the proofing stage. I’ve completed a book ‘Jupiter Doesn’t Listen’, yet to be published but very stimulating I think. In addition I’ve written and illustrated a longer story for older children, ‘There’s a Monster in the Ocean’- this environmental adventure is currently being pitched by a Director of animation to producers for a potential animated film. I am very pleased with both of these and hope they will also be published as books. 7) What advice do you have for aspiring illustrators? Find an agent, something I’ve yet to do!! This is a sample from ‘Jupiter Doesn’t Listen’ a comical story also professionally translated into Spanish, for 5-7 yr. olds. 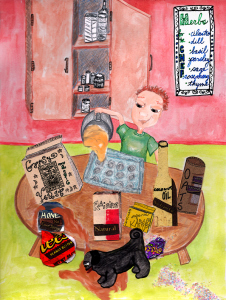 Jupiter, a budding 6 yr. old artist, son of ‘alternative parents’ products of the 60s, whose habit of not listening to grown ups gets himself along with his brother Mars and pug dog Buddha, into some very comical mishaps in the city of Portland, culminating with a trip down to the police station. 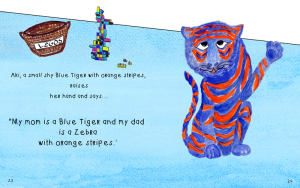 The second two samples are from ‘Purple With Stripes’, is a picture book involving a purple striped elephant Ely, who doesn’t want to begin pre-school, afraid the other kids will make fun of his unusual stripes. The other animal students in fact do mock Ely, but in the end all learn that though all different we are truly all equal and the same. Should you wish to know more about Deborah Eve Alastra, here are her pertinent details. Anna Lloyd has enjoyed drawing and painting since she was very young. She spent many a lunch hour with her friends in the art room at school. She also has a university degree in Design, majoring in Illustration. One of her tutors at University was illustrator Tony Oliver. Anna Lloyd is an illustrator based in Sydney, Australia. 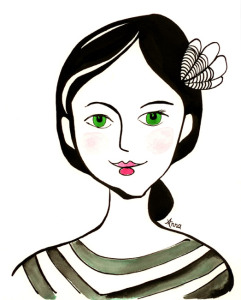 Anna is a versatile illustrator who works in a wide range of mediums and styles. Her work includes whimsical illustrations in pen and ink, watercolour, pencil and acrylic paint as well as mixed media paper projects. An Author found my website portfolio, liked my style of illustration and asked me to contact her publisher. 2) Describe your illustration style. My illustration style is fun and colourful using a mixture of mediums including, watercolours, pens, ink, pencils and acrylic paints. 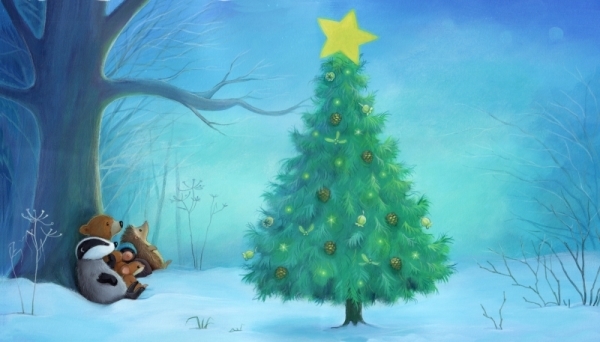 I am happiest illustrating animals, but I like to mix it up a bit. I really enjoyed reading and looking at artwork in children’s books and other forms of art when I was a child. I immersed myself in art books throughout high school and my parents took me to a lot of art galleries. The people who encouraged me in art as a child were my biggest influencers, my grandparents, parents, art teachers, tutors and friends. Now I am influenced by other artists and the artwork I admire. I read the text then look for a whole lot of reference material that will support the work and start sketching. Once I have finished a page or several pages I send them through for approval. 6) Tell us about the proudest piece of work you have done. I don’t think I have made it yet… Aren’t we all striving for the next work to be better than the last? Work really hard, practise and live and breathe your work. 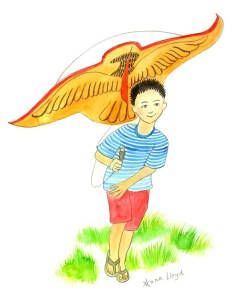 This is an illustration of a little Vietnamese boy running with a kite. With this one I was hoping to convey the freedom of being a child. Watercolour and pencil illustration. An illustration of a girl with a shell in her hair. This is a fun little illustration in black ink and watercolour paint. 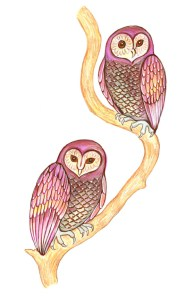 Two beautiful native Australian owls sitting on a tree, illustrated with markers and coloured pencils. Should you wish to know more about Anna Lloyd, here are her pertinent details.